How important are academics in the athletic recruiting process? 1 – Be a really good Student. While big-time football and basketball programs may have some lax academic standards for recruits, most college coaches will not recruit you if you are not close to what their college looks for academically. You need to focus on your grades and research colleges where your academic record is a fit with what that college looks for in an applicant. While coaches have the ability to submit lists of student-athletes they are actively recruiting to admissions, this varies at every college as to how effective it can be! How important is athletic skill in the athletic recruiting process? 2 – Be a good athlete. My summer coach used to talk about the pyramid where you have all the high school athletes here, then you have college athletes above and then you have pro athletes above. Some athletes are simply better than others, a fact you must accept. This doesn’t mean you cannot work on your game as well as your physical attributes (size, speed, stamina, coordination) to get better. Work on all aspects of your game. Work on your weaknesses. Work on how you approach the game mentally. Work on learning the rules of the game and so forth to try and get better. How realistic do I need to be in the athletic recruiting process? 3 – Be realistic. You may have aspirations of playing football for Alabama or Basketball for Kentucky, but only a select few high school athletes have the skills to play for programs of that caliber. There are over 1,000 NCAA colleges and several hundred NAIA and Junior colleges that you can potentially play your sport at. It’s important to try and find a college where your skills match up with the level of play in a given program. You might not be able to play at a high level D1 program (or even a highly skilled D2 or DS3 team), and you might not qualify for athletic scholarship money, but if you have the skills to play in college and apply yourself in the athletic recruiting process, there is a place for you to play! See: How do I determine what level I can play at? How proactive do I need to be in the athletic recruiting process? 4 – Be proactive. While a few students are “discovered” being found is mostly a myth. College coaches rely on high school athletes reaching out to them for the purposes of being recruited. You need to fill out online recruit forms on the college’s website, email coaches directly and in many cases, call them to introduce yourself. Do not try to get recruited from one email or one phone call, rather focus on simply introducing yourself to them as a person who is potentially interested in their school and program. See: How do I contact college coaches? How many programs do I need to research for the athletic recruiting process? 5 – Do the research. The mistake many families make in the recruiting process is they reach out to colleges and coaches at schools they are not qualified to play at. While college coaches like to hear directly from recruits, they like to hear from recruits that have done some research on their school and program and think it might be a potential fit. So, before you are proactive in contacting them, you need to be proactive in researching many different programs. Who does the school play? who does the coach recruit? Where does the coach recruit? How do I evaluate my athletic skill for the athletic recruiting process? 6 – Evaluate your athletic skill. Determining your athletic skill can sometimes be tricky but self-reflection helps. How do you perform against other players at your high school? How do you perform vs. other players in your league? How do you perform against other players in your State? How do you perform against other players in the country? The recruiting process is a global process. You are not competing against players on your high school team, you are competing against every qualified high school athlete in the country if not the world in some cases! You need to play in different events and venues against different competition in order to understand how your skills compare to other players. See: How do I determine what college level I can play at? How much athletic scholarship money is out there? 7 – Be prepared to pay for college. Many parents are chasing the pot of gold at the end of the rainbow to recoup the investment they have made in their child’s athletic career thus far. After Division 1 football and Division 1 basketball, there is very little money in the form of athletic scholarships for other sports. In reality, you might have a better chance to be an academic star and apply to colleges that have a hard time attracting applicants in the hopes of receiving academic aid and grants. Sports like baseball with 11.7 D1 scholarships or Lacrosse with 12.6 athletic scholarships divide their athletic scholarship money between many recruits, and that is if the program is even fully funded which many are not. Despite your talents, if you receive a one third athletic scholarship at a private college, you will be on the hook for an additional $40,000 in tuition money each year if you don’t qualify for financial aid. See: What are the odds for an athletic scholarship? How hard is it to be recruited by college athletic coaches? 8 – Get off the beaten path. There are colleges that receive 30,000 applications a year and colleges that many recruits gravitate to because of the success of the program, reputation, coolness factor and so forth. The John Hopkins Lacrosse team is not hurting for recruits as just about every lacrosse player of note in high school probably wants to play there. Then there are programs like Occidental College that just canceled the remainder of their D3 football schedule because they lacked enough players to continue the season. When you subtract the colleges you know from watching football or basketball on TV and the colleges you know near where you live, there are another 900+ colleges you have never heard of that all potentially offer an opportunity to play college sports. The more research you do, and the more college coaches you reach out to, the more recruiting opportunities you will create. For more information on succeeding in the college athletic recruiting process, check out The Making of a Student-Athlete our 241 page guide. Snowmageddon coming to New England and the college recruiting process. With the impending blizzard rumored to be dumping 24 inches of snow on New England this week, thousands of college athletes who play spring sports are soon going to be wondering if they will have a season. And thousands of high school athletes are wondering if they want to stick around here for four more years to play college athletics. Two weeks ago, it was 70 here. People were at the driving range, flowers were coming up and life was good. Now, not so much. The lure to play college athletics in a warm climate is a powerful one, but often one fraught with challenges. I myself was a victim who went south to Florida from Massachusetts to escape many things when I was younger. My college career in Florida lasted all of two weeks. The players from there were simply better and the recruits who were recruited from out-of-state were also better. While specialization is a controversial topic I have addressed in other articles, when given two equal players of similar athletic ability, the player that specializes in one sport is probably going to be a little better just like the lawyer who studies more law is going to be a better lawyer. In New England, you often have players that play football in the fall and basketball in the winter and maybe baseball in the spring, then they play their dominant sport in the summer! In Florida and other southern states, you have athletes concentrating on one sport more and athletes that can concentrate on one sport more because of the weather! There is simply 4 months in New England and other players where you simply cannot play baseball or softball outside because it’s simply too cold! The high school baseball player from New England or Michigan (pick a place that is cold) has many disadvantages when trying to play baseball in a state like Texas or Florida. Let’s stick with Florida. It’s a state with thousands of high school baseball players who play their sport year-round. 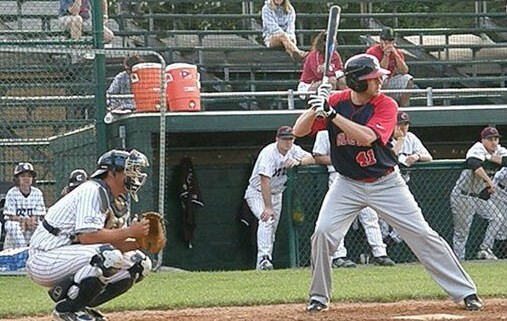 It’s a state with many talented college baseball programs at all levels, even the D3 programs. If you are interested in playing against the best, you don’t have to leave the State for college and you can attend a State School for half the money of a school in another State. On a side note, Florida also guarantees admission to State Schools in a program called the Talented Twenty program for academic qualifiers. From a college coach’s perspective, you can fill your roster with recruits in your own backyard without having to leave the state. Teams like Saint Leo, Nova Southeastern, or Florida Southern have rosters comprised of virtually all players from the state of Florida. Even big schools like Miami and Florida State recruit almost exclusively in the state. If you are a college coach at a State School, you have the added benefit of being able to stretch your precious scholarship dollars further with in-state recruits who qualify for a lower tuition number. While a star player from Minnesota might want to come to Florida to play baseball, a college coach may have little or no college scholarship money to offer them. Now that player must decide if they want to turn down offers locally to pay full freight at a school in another state just because it’s warmer! So where does this leave the out-of-state recruit who doesn’t want his arm falling off playing in New England in the “spring” where it’s 39 degrees out for half your games? On the outside, unfortunately! The biggest challenge for out-of-state recruits is that not only do they have to be as good as their Florida counterparts, they have to be better! Here’s why. When a northern kid comes to Florida, they have different expectations. They were a star on their team and they expect to play. When they don’t play right away, they realize they could be playing at the long list of schools that were recruiting them locally back home. What happens now is they get frustrated and leave. Southern coaches have seen it time and time again, and they are often weary of recruiting kids up north because of this. When the Florida player doesn’t play right away, they don’t flee home, because they are home! Not playing right away is not as much of an issue. They understand the talent in their state and that they must bide their time. They don’t pack their bags and call the coach in Maine to fly 1,500 miles from home to play baseball in an igloo! So how do you succeed down south? 1 – You have to be extremely talented and confidant in your abilities. 2 – You need to see how your skills match up with local players somehow, possibly through a team that travels down south to play local teams! Simply assuming your skills will translate to a given state or school down south “just because” won’t cut it. This goes for any college really. You can never assume you can play anywhere until you have done your research on what types of players a school recruits! 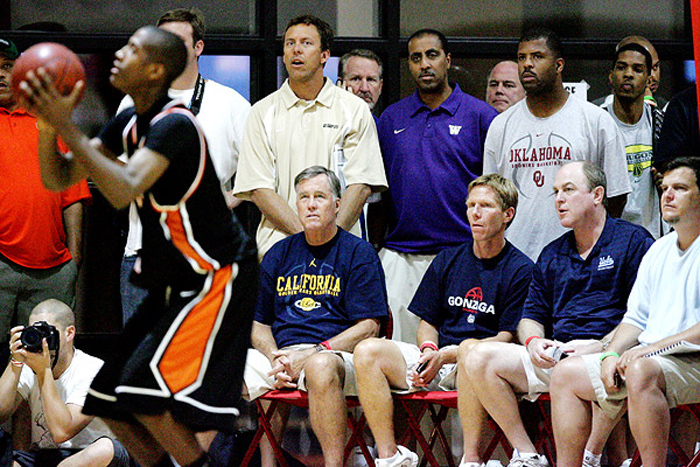 3 – You have to really connect with college coaches and try to understand what their plans or expectations are for you. This isn’t always easy and some coaches will be more honest with you than others. 4 – You have to be patient. You might now be a small fish in a big pond. You might not play right away. This is hard for every incoming freshman athlete, but can be harder for the elite high school players who haven’t sat on the bench since 5th grade! 5 – You have to be willing to potentially pay more for college. Any state school is probably going to recruit more in-state players simply because their scholarship dollars can be stretch further. They may want you on their team, but they might not have any or very little money to offer you. What factors do we need to consider in the college athletic recruiting process? There are many things to consider in the college athletic recruiting process for high school athletes and their parents. What works for one family will not work for another. Where one family succeeds, another might fail. While there are some best practices, there is no set path to success and no road map to follow that will guarantee the outcome you desire. There is a lot of luck too! With that being said, I believe there are 5 non-negotiable factors in the recruiting process that you must check off in order to succeed as a college athlete and graduate with a degree. This one is pretty simple. Your grades will ultimately determine what colleges you can get accepted to. The first question a college coach will usually ask you is “how are your grades?” For them, if they aren’t up to par, it’s not worth their energy to pursue you because no amount of athletic skill is going to get you accepted at most institutions if your grades and test scores are too low. We aren’t even discussing NCAA eligibility, because the criteria for that is far lower than what most colleges require academically for acceptance. Do coaches have some sway on the acceptance process? They sure do. College coaches can submit lists of high school recruits they are actively recruiting and would like to see attend their institution for consideration to their admissions department. This practice and the strength of this practice varies at every school. Regardless of how prevalent this practice is, the most important factor needs to be that your grades and test scores need to be extremely close to what the school considers in every student that applies each year. Want to go to Vanderbilt? Fantastic, 94% of their admitted applicants in 2016 were in the top 10% of their graduating class. The next important piece of this puzzle is that while schools may bend, they will only bend in a few instances, meaning they might let one fringe student-athlete in for the soccer team and one for the baseball team and one for the field hockey team and so forth. Since you cannot control who the coach is recruiting and who the other 20 coaches at that school are recruiting, you might be on the low end of the low end of recruits who are on the bubble academically. At the end of the day, if you cannot get into the school with your academic record, your recruiting process is over and no amount of skill or ability is going to change that for many schools! Once you have cracked the academic challenge, the next biggest factor is your athletic skill. There are 3 NCAA divisions and roughly 1,200 colleges that compete. No two schools or programs are alike. What one college coach values, another may not. Where one college team succeeds, another in their conference may not! While Rudy was a great movie, Rudy would have been better served attending a small D3 college if his goal was to play college football. While your desire may be to play basketball at Kentucky or Baseball at LSU, or football at Notre Dame, only a few elite high school athletes have the skills to play at those levels. While we encourage high school athletes to aim high, you need to aim where your skills and abilities will be a good fit! At the end of the day, if you cannot play at a given school given your athletic abilities, your recruiting process for that school is over. Matching your athletic skills with a given program is challenging. You need to do some self-reflection, seek out opinions of other skilled coaches who have seen you play and you may need to get out of your town or league and compete against other high school athletes to get a better sense of where your skills lie. Once you have done that, you need to research different college programs in detail. Who do they play against? What is their success rate? What types of players does the coach recruit and from where? The very best programs recruit players from the entire world. The smaller programs might recruit players within 50 miles of their school but it’s different for EVERY school! College is expensive, even the public colleges are creeping up in price. Finances plays a role in every family’s college choice and no one wants to leave school with massive student loan debt that will hound you for years after graduation. We always tell families to never dismiss any college until you have explored the financial aid process for that college to see what aid you might qualify for but past that, finances must be considered. With the exception of football and basketball at the D1 level, there is very little athletic scholarship money to go around. Other sports simply do not generate revenue at the college level and less resources are given to those programs in the form of athletic scholarships. I know many D1 programs that have one or two scholarships for the entire team. The other factor to consider is that even if a team is fully funded with the max level of athletic scholarships, the coach usually divides those to many players. A D1 baseball team is allowed 11.78 scholarships per team, but most rosters will contain 30+ players. If you are an elite player, you might get some full scholarship offers in baseball, but in most cases, the coach will divide those scholarships up into percentages like 33%. If you want to attend private school and receive a 33% athletic scholarship, you may need to find an additional $40,000 to cover tuition. You must explore all your options financially. Grants, loans, merit aid, financial aid and academic scholarships. At the end of the day, you must be able to pay for college and/or decide how much student loan debt you can tolerate after graduation. Let’s stick with the theme here, every college is different. Some colleges have 40,000 students and some have 2,000. Some are in big cities and others are in the middle of cornfields. Some are sprawled across 20 city blocks where you take busses to classes or dorms and others can be walked end to end in 10 minutes. Some will have students from all over the world and others will have students that all live within 50 miles from your hometown. Some colleges might be too liberal for you, while others might be too conservative. The social aspect of a college and how that will affect you might be harder to figure out, but you need some understanding of who you are and what you are looking for. If you dislike cities or crowds, then I wouldn’t suggest going to a big school in a city. If you think you will be bored at a small school with 1,500 students’, you very well might be. You need to spend some time on college tours to try and understand the school and understand whether you will be happy there for four or five years. And if your athletic scholarship is tied to you being happy, then you really need to pick the right school socially for you. The geography of a school can play a dual role in your success as a college athlete. One, geography can determine how good a given athletic program is. Colleges that play in warmer climates often attract better players who want the ability to play more games in better weather. 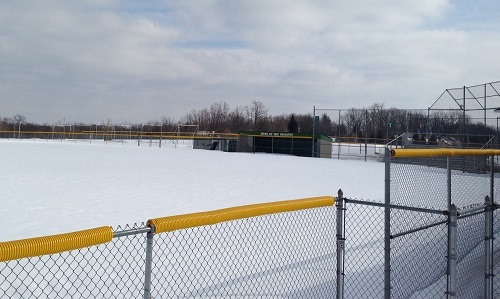 The State of Florida is a great example of this, not only does the State produce many talented high school baseball players, but top players from throughout other parts of the country gravitate to colleges there from colder climates because playing baseball in April in Michigan or New England in 40 degree weather simply isn’t that enjoyable. The second factor that geography can play is how far you want your safety net of home and how involved you want your parents in your athletic career. My parents drove down from Massachusetts to Connecticut every weekend to see me play. Had I been somewhere else, they might not have gotten to experience my college athletic career. I was also afforded the ability to travel home more easily given the shorter distance when I needed to. But geography can play opposite role as well. Several years ago we met an extremely talented golfer who was being recruited nationally. One would think he would have chose a school where it is warm year-round so he could play year-round. The opposite happened. He chose a school in a colder climate that had a real winter. When we asked why, his answer made sense. He said, “I needed to go to a place where it snowed in the winter so I would get a mental and physical break from golf, and I knew if I went down south, I would be at the range or the course every day for 9 months and that is simply something I didn’t want to do!” It’s really important to understand how geography plays a role in the skill of a given college program and how the coach recruits. Geography can play a huge role in your success or happiness. There are fewer elite players in warm climates beating down the doors to go play at colleges where it snows in the winter, but there are thousands of elite players beating down the doors of other colleges where the weather is better. It’s also important to understand how being 20 miles from home or 2,000 miles from home is going to affect your psyche. Some high school athletes cannot wait to get far away from home, and others struggle with distance. So how do these five concepts affect my recruiting process? Excellent question! The first two will greatly impact your recruiting process. If you cannot gain acceptance to schools you are potentially interested in, or schools where coaches want to recruit you, your process is over! If you do not have the skills to play at certain programs (or any program), your recruiting process is over. The financial, social and geographical concepts are tricky. You might not be thrilled with any of the three but you might be able to function and succeed as a college athlete depending on how tolerant you can be with any and all of them. Perhaps your parents are happy flying out once a year to see you play. Perhaps playing baseball or soccer in colder weather isn’t terrible because you are at a great school and getting a great education which will have value down the road in your professional career. Perhaps you don’t have time to interact with the students that are too liberal or too conservative at your school because you are so busy with your studies and your athletic career! Perhaps you absorb some student loan debt at a better college because it will offer you the chance at a better job upon graduation and will be easier to pay off. How does the number of high school athlete affect my chances of receiving an athletic scholarship? How does the number of high school athlete affect my ability to get recruited? What percentage of high school athletes will play at the college level? Some recruiting services pitch exposure as the ultimate recruiting tool and the number one reason that you won’t be recruited, using the theory that if college coaches do not know you, they cannot recruit you. While exposure is important, it’s exposure at the right level coupled with what a coach needs for their team and what a coach looks for in a player. No amount of exposure will help you get recruited by any college coach in any sport if you lack the size or skill to play for that particular coach and/or team. According to the National Federation of High Schools, the greatest participation by high school athletes is in high school football, with 1,023,142 boys participating at the high school level? What does this mean for your recruiting efforts? Well, nothing really! 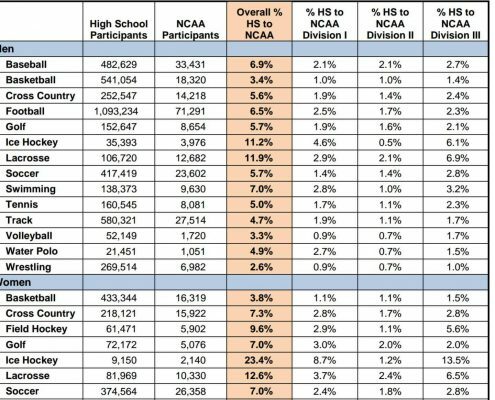 The “6.9 million high school athletes” participation figure has nothing to do with YOUR recruiting process mainly because over 6 million of those kids are underclassmen and don’t play your sport and quite frankly, it’s a meaningless number. If you want to know how meaningless it is, consider this – Nationally, out of 100 9th graders, 68 will graduate from high school, 40 will enter college directly, 27 are still enrolled in college in their second year, and 18 will graduate from college. – US Dept. of Education – So right away that 6.9 million number has been shrunk greatly because not all of those kids will even make it out of high school, which will probably make it difficult for them to be college athletes. Now let’s look at the second statement in more detail about high school football participation. There are several problems with looking at the football participation number. First off, not every high school athlete who plays football in high school is interested in playing in college, just as not every person who goes to high school goes to college. Some students play sports in high school just to play sports and have no desire to continue after high school. My high school baseball team senior year had 6 seniors. Only myself and one other player attempted (and succeeded) to continue our baseball career at the college level. So the number of players I was competing against on my team dropped 66 percent because 4 of them didn’t try to get recruited. I despise graphic the NCAA puts out because in no way does it factor in the number of players in each sport who were even interested in playing in college or who have the actual skills needed to play in college. This is not a probability chart in any way. If you have the skills to play in college and apply some effort to your recruiting process, your probability of playing in college is 100% If you do not have the skills and athletic ability to play at the college level, your probability is zero percent! Now let’s look at the second figure about 5,042 athletic scholarships each year at the D1 level for football. D1 football team are required to offer 85 athletic scholarships (and no more per team) and there are roughly 130 football teams at the 1A level and you can divide 85 by 4 because each coach has about 21.25 scholarships per year. In reality, Division 1 football coaches can sign 28 recruits under the NLI program but can only have 25 players receive a scholarship in the new year, but for use of this example I will stick with 21.25 because they cannot have more than 85 players on the team under full scholarship. At the D1 level, there are roughly 2,762 athletic football scholarships available each year. (21.25 scholarships x 130 schools) give or take a few scholarships as no coach can recruit .25 players. There are about 116 1-AA football teams. These teams are allowed to offer 63 athletic scholarships per team. 63 athletic scholarships divided by 4 years equals about 16 scholarships a year. 16 scholarships a year times 116 teams equals 1,856 athletic scholarships available per year. But wait, each football team in the Ivy League competes at the 1AA level, but they do not offer athletic scholarships. Now we have to deduct about 150 scholarships to maybe 1,706 at the 1AA level. It’s also unlikely that every 1AA team offers 63 scholarships but for the sake of argument, we will say they do. Now, let’s say there are roughly 4,468 football scholarships (2,762+1,706) awarded at the Division 1 level and Division 1AA level each year, and that’s assuming every 1AA team offers the maximum of 63 athletic scholarships (highly unlikely). Not every high school football player is going to play D1, wants to play D1, or can play D1. How can someone say that you are competing for a scholarship at the D1 level against a 150 pound backup receiver at pick a name high school who would be lucky to play at a low level D3 program if anywhere? Let’s say 50% of all high school (senior) football players want to play in college (which I think is a very generous estimate), the total number drops to 127,000 senior football players. Now there are 130 1A teams, 116 1AA teams, 151 D2 teams and 229 D3 teams. That’s 626 teams. If each team had 50 players, there are enough spots for 30,750 high school football players to play in college. Some college programs carry over 100 players even 120 and sometimes might only have 40, it all depends on the program, but 50 per team I think is a fairly generous estimate on my part. Let’s now say that out of those 127,000 kids who want to play football in college, only 20% have the skill, the size, the speed, and desire to play at the highest D1 level. Now the number is 25,400 players. A far cry from the 1-50 odds of getting a D1 scholarship and more like 1 in 6. (25,000+ players for roughly 4,000+ spots). This doesn’t factor in the fact that many of these players might be basketball or baseball players who have no interest of playing football in college, but are still playing football in high school and get counted in the pool of 1 million plus players. And this will go for many sports, as there is so much overlap at the high school level. If a football player is really a baseball player trying to get recruited for baseball only, you aren’t competing against that player for a college football roster spot, because they aren’t interested in football at the college level. But they are getting counted twice in the above graphic which throws the numbers off even more. It has nothing to do with numbers of high school players and all to do with how many players want to continue at the D1 level and have the skills to continue at the D1 level. If you don’t have the size, speed and skill to play at the D1 level, you have NO odds (It would be like trying to win the lottery without actually purchasing a ticket! ), but if you do have the size, speed, skill and desire to play D1 football, the odds of you receiving an athletic scholarship are better than people might lead you to believe. In reality, you are not competing against 254,000 other high school football players, you are competing against a few thousand kids who possess the size, skill and speed to play at that level. Again, while exposure is important, it’s exposure at the right level that will help you get recruited. No amount of exposure will make up for a lack of size, speed and skill, especially at the D1 football level (or any level for that matter). These same arguments apply to any sport, regardless of exposure. In order to receive an athletic scholarship, three things have to happen. One, you have to find a program that has available scholarships to offer. Two – you have to find a program that has a pressing need that the coach is trying to fill, meaning if you are a catcher or a goalie and the coach has 3 catchers or 3 goalies already, they might not be recruiting for your position despite your success or skills. And three, you have to be extremely talented and you have to contact the coach and find a way to display your skills to that coach. While there are hundreds of thousands of high school athletes, there are not hundreds of thousands of high school athletes that have the skills to compete at the high D1 level or the skills to be awarded an athletic scholarship. 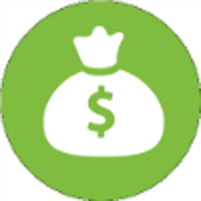 http://www.varsityedge.com/wp-content/uploads/2016/03/money_bag.jpg 201 201 Varsityedge http://www.varsityedge.com/wp-content/uploads/2016/04/Logo_April_27th.jpg Varsityedge2016-03-26 16:08:372018-03-05 20:13:24What are the Odds for an Athletic Scholarship? Can high school athletes control what college coaches recruit them? I read an article recently about a recruiting seminar by a “renowned speaker.” He says: “You don’t choose the colleges. The colleges choose you.” I beg to differ!!! While your non-athletic classmates are busy researching, applying to and “choosing schools”, high school athletes seem to think they are “chosen”, and they often wait for the process of recruiting to unfold around them and wait to see what coach calls them and what offers they get! 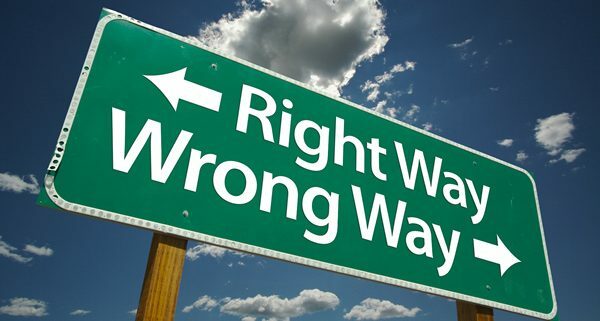 The recruiting process is about discovery, knowledge, desires, and making an informed decision that is the best decision for YOU, not right for the coach, not right for the school, and in some cases not even right for your parents. Best doesn’t mean the most scholarship money, the best team, the team on TV every Saturday, or the team featured in Sports Illustrated every week, or the strongest athletic program. Best we believe is the school that provides you the combination of these four ideas. How do high school athletes choose what college is best for them? 1. The athletic program that allows you to participate at your desired level against the best competition you can compete with and against. 2. The academic programs that allow you to learn and succeed, and prepares you for gaining employment and a successful working career after college in a subject, field, or major you have an active interest in. 3. A social environment that allows you to go grow as an individual, experience things you may not otherwise get the chance to experience and make life lasting friendships. 4. A school that you can afford to pay for without incurring large student-loans that will hang around after you graduate. Again, geographic location should be considered if you think you will be unhappy far away from home, if traveling back and forth may be a problem, or if your family will want to watch you play often. If any of these four attributes are out of balance, it can cause major problems for student-athletes. Now, back to the question of whether the colleges choose you! There is some truth to this because college coaches will contact or come into contact with perhaps a few hundred high school athletes and then based on the coach’s needs, and the feedback they get, they reduce that list of potential recruits and eventually make offers. The coaches in a sense choose who they want. But the process works both ways and you have to take control of what you can control in your process. What can high school athletes control in the athletic recruiting process? You can control how hard you work in school. If you want straight A’s, that is achievable, it will just take a lot of hard work! What will straight A’s get you, you ask? Well, it will open application doors to colleges other recruits might not be able to gain acceptance to on their academic record and it will make you more attractive to admission boards and college coaches. While a college coach may start with a list of a few hundred recruits each year, I can guarantee you that list becomes pretty short when grades and test scores start arriving on the coach’s desk. Grades alone might wipe out half of their potential recruits. What else can you control? Well, you can control how hard you work on the field or in the gym. Some high school athletes are just naturally good at sports; others have to work harder. The harder you work, the more you will improve. If you are weak in a particular area, work on your weaknesses! What else can you control? How about how far you extend your recruiting reach. If you are simply playing high school ball for 2 months and not getting out on the road in different tournaments or camps against higher level competition, you are reducing your exposure. Very few college coaches have the time, resources or desires to recruit athletes at high school games in this day and age. Their season takes place when your season does and much of their recruiting efforts take place in the summer when they are free to recruit. What else can you control? How about how many schools you research! We spoke earlier about how many high school athletes wait to be recruited, but it’s the families that kick the most tires that create more recruiting opportunities. If you live in New England, there are probably a 100 colleges within 200 miles of your house in ANY direction. There is no excuse for not getting out on the road and touring different colleges or spending more time online researching different colleges. If you live in a place where there are fewer schools, you are going to have to find a way to research more colleges. The ultimate control you have is how you package this all together. College coaches want to recruit smart, talented, hardworking and dedicated athletes who express a desire to attend their college or university. It is as simple as that. They start with academics. If you cannot get in, they will not recruit you. Then they move onto athletic skill and they ask themselves if this recruit can play and succeed at their program. Then they move onto personal character, meaning is this recruit a good person? Then they move onto desire, meaning, does this recruit have a real interest in being a college athlete and attending my institution? And somewhere in that process they might ask themselves if this recruit can afford to attend their institution? Ok, let’s tie all this together. If you are a successful academic student who is a good person and a successful athlete who works hard on the field and you research colleges that will be a good fit for your skills and you connect with coaches personally to express your desire to attend their institution, you can increase your ability to CHOOSE what school and program you attend. The best blue chip athletes in the country are choosing the schools they attend because their skills are so high and every coach wants them. You have that same ability, but you cannot apply to the same schools they are applying to or take the same approach! You have to find colleges where your “skills” might exceed what the college coach typically looks for in a recruit. When you package that with a strong academic record and the desire to succeed on the field, in the classroom and in life, you will have the ability to choose what college you attend and what athletic program you play for! What is the most important factor in the college athletic recruiting process? 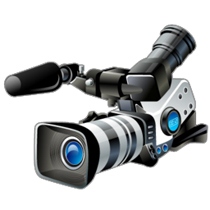 Can I increase my exposure in the college athletic recruiting process? If I asked you who Phillip Phillips, Carrie Underwood, or Kelly Clarkson are, that might be an easy answer for you. They were all American Idol winners and immensely talented singers who have gone on to successful music careers since the show. But can you tell me who Shannon Magrane, Paul Jolley, or Andrew Garcia are? They finished in the top 10 of American Idol in the last several years out of a pool of millions of contestants. While some contestants are still in the music business in some capacity, you probably won’t find them performing at any large concert venues or award shows. Is exposure the most important factor in the athletic recruiting process? It is true; you cannot get recruited unless a college coach knows your name or unless you are exposed to them somehow. But a college coach knowing your name is hardly the deciding factor in whether or not you get recruited. Each week the three top ten finishers listed above sang in front of not only millions of viewers on TV, but in front of every music executive in the country if not the world. The tenth best singer out of a pool of possibly a million people that show up at the American Idol auditions wasn’t offered a record deal or a job in the music business after the show. How can this be, as they had more EXPOSURE than any musician in the world could possibly ask for?? There is no magic bullet to recruiting. Exposure is not a path to success. To succeed in recruiting, you have to have a unique set of skills (academic, athletic, social, work ethic, desire) that other recruits do not have. Then you have to find a college and a college coach that has a need and a desire for your skills. Then you need to personally communicate with that college coach. And after all that, you might fail to get recruited. You might be a great goalie, but if a college has three already, there will be no need to recruit you. You might be a great center, but if your grades are sub-par, the ability for the coach to recruit you will be diminished. You might be fast, but the coach needs someone faster. You might be big, but the coach needs someone bigger. Yes, and after you reach out to them, the next thing that matters is HOW GOOD YOU ARE! And it matters a LOT! How good are you on the field, how good are you in the classroom, how good of a person are you? How good you are matters! Anyone can reach out to any coach, their email is plastered all over their school’s website or through a recruit contact form. But that will get you nowhere if you don’t have several other things going for you. What factors do college coaches consider when evaluating high school athletes and recruits? 1 – Can this recruit get accepted to my school based in their academic record? 2 – Does this recruit possess the athletic skills to play for our program? 3 – Do I have the ability to evaluate their skills to make a fair evaluation? 4 – Is this recruit truly interested in playing for my program? 5 – Can this recruit afford to come to our school? 6 – Does our school offer academic programs this recruit is interested in? 7 – Will this recruit be happy and successful at our school? If the answer to ANY of those questions is NO, then your recruiting process is probably over for that school. You can expose yourself as much as you want to as many schools as you want to, but no amount of exposure will get you recruited if those questions above are not met by you! The most successful families in the recruiting process work backwards. They research the colleges that are a potential fit athletically, academically, socially, financially, and even geographically and then they make personal contact with the college coach to discuss a potential fit. They do the grunt work for the college coach. Then when they hear twenty “thank you but no thank you” from college coaches who work at colleges that might have been a perfect match for “the recruit”, they move onto the 21st school on their list because it only takes one yes to succeed in this process. Every “no” they hear is a chance to move on and succeed at another school. Exposure is their goal, but exposure is the last trait on a long list of traits that will lead them to success in this process. Your college recruiting process is extremely important. Don’t leave success in the hands of an app, or widget, or website that promise the world; that promise to make things easy! It’s a personal process that takes a lot of time, dedication and research to succeed in.